Not that any of us need reason to indulge (life’s short, you feel me? Treat. Yo. Self. ), but it’s always great when doing something nice for yourself also does something nice for other people. And so, dear friends, let us bask in the satisfaction of simultaneously eating cookies and donating to charity. 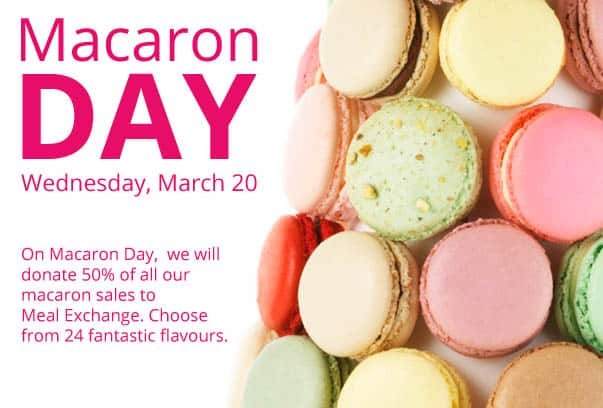 Tomorrow (Wednesday, March 20) is Macaron Day, and to celebrate, Toronto bakery Nadege is donating 50 percent of the day’s total macaron sales to Meal Exchange. This national charity is all about educating youth to work with their communities to create food security for everyone. Nadege will have 24 (double their usual offering) delicious flavours to choose from, including classics like cotton candy, special offers like roasted marshmallow and Guinness, and cool combos like bacon-maple. MMMMMMMMMMMmmmmmmmaple. Both locations are participating, meaning you can either hit up 780 Queen St. W. or 1099 Yonge St.
Nadege’s goal is to raise $5,000 for Meal Exchange, so stock up on those tasty little sweets—both your tastebuds and your conscience will thank you for it. Happy trEATing! shedoesthecity nadegetoronto I forsee much eating. shedoesthecity Why are you calling a macaroon a macaron? JillLockwood Thanks for helping promote it! Hope you enjoy #MacaronDay!